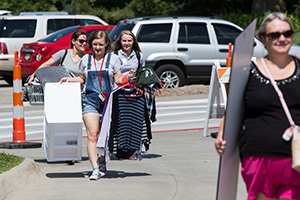 Research has found that parents can have a powerful influence on their sons' and daughters' successful transition to college life. All it takes is communication. Talk to your sons and daughters before they come to UNO, and keep talking to them while they're here. As parents, you have already done a great job helping your sons and daughters make better choices. However, your responsibility doesn't stop just because they're heading to school. Studies have shown that college students give parents a great deal of credit for guiding them towards less drinking or refraining from drinking. Your input matters — and helps keep UNO a leader in students’ responsible use of alcohol. You can help them during this transition by communicating your expectations and encouraging them to think through the outcomes of different choices. Parents can also have an impact on the misperceptions of college life, including alcohol use, while providing information about resources available to their student on campus. Regular conversations about making good choices with your son or daughter is important when your student is living away from home.